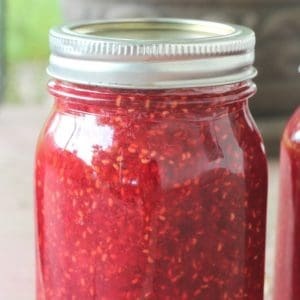 June 21, 2018 0 comments on "Raspberry Jam"
I love raspberry jam. It is one of my favorite kinds of homemade jam. I have fond memories of my mom making it when I was a child and enjoying it with butter and toast. I have been trying to get my raspberry plants going for the past couple of years, and this year I finally have enough raspberries to can some homemade raspberry jam. Now that I have so many raspberries, I will have to search for some more recipes for fresh raspberries! I do have a great recipe for raspberry vinegar or vinaigrette I will have to try again. Let the jars sit on the counter at least 24 hours to cool and give the jam time to set. If you have any jars that didn’t seal, place them in the refrigerator to eat in the next couple of weeks. Sealed jars can be stored in the pantry for 1-2 years. Like this recipe? Try my recipes for making raspberry freezer jam or canning plum blackberry jam or spiced peach jam.